Buster Boats is a well-known aluminum boats manufacturer and a market leader in its industry. They excel in producing highly reliable, low-maintenance boats, and in R&D. Kemppi solutions, such as the new X8 MIG Welder, as well as joint R&D are signposts on the road to success for Buster Boats. The Buster story began in 1976, when the Fiskars group decided to move the manufacture of aluminum boats from the Kellokoski Works to the Inha Works located in Ähtäri, Southern Ostrobothnia region of Finland. The boat range varies from 4m to over 9m, from 2 horsepower (hp) up to even 700 hp. Durability, safety and ease of use were taken as the starting points when designing the new boat range. “The key to our success at Buster Boats is based on good quality and strong product development and R&D,” comments Director of Operations, Harri Hinttala, Buster Boats. Today, around 70 per cent of the production is exported from Finland. Inha Works is Europe’s largest manufacturer of aluminum boats, and Buster, with it’s already achieved iconic status and successful performance in many tests, is the most popular boat brand in the Nordic countries, mainly Finland, Norway and Sweden. Buster Boats have been made to withstand even tough conditions. They have even been used to sail around the North Cape from the Arctic Ocean to the Atlantic. The Inha Works employs about 150 persons in Ähtäri, of which 30 are welders. Kimmo Multaniemi, the Foreman of Boat Production, oversees welding and the final frame features. “At the moment, we have about 70 welding machines at the Inha Works. Of those, 60 are Kemppi welding machines,” Multaniemi explains. 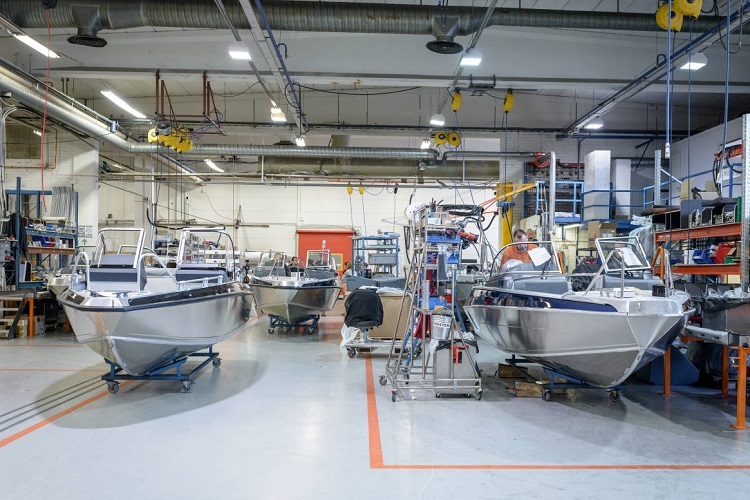 Three boat manufacturing phases are carried out at the Inha Works premises: sub-assembly and parts manufacturing, welding, and final frame features. The company uses MIG and TIG welding. 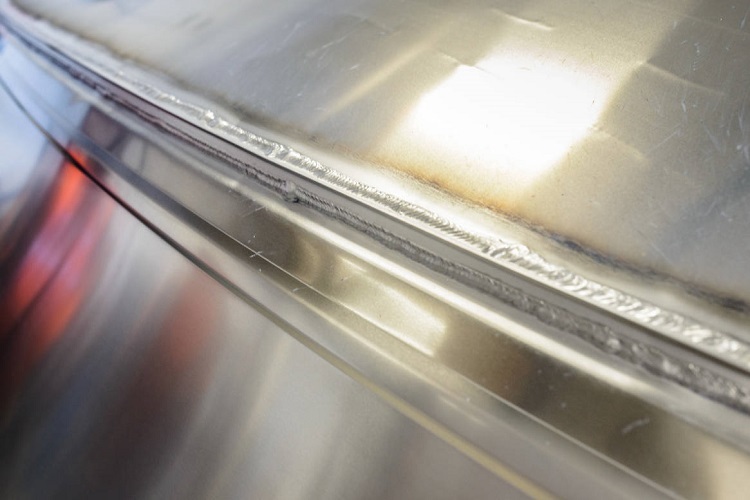 For example, TIG welding is mainly used in the visible parts of the boats for neater seams. “Our customers appreciate good craftsmanship,” Multaniemi says. To meet customer expectations, the welders must have proper tools and means. “Welding aluminum is quite demanding, and this calls for first-class welding machines. One of our main challenges in aluminum welding is also keeping the workplace clean and tidy. Also, all welders must be trained for the job and their qualifications are regularly controlled. We have daily quality controls and an inspection record is made of each boat,” Multaniemi explains. “Our main reasons for cooperating with Kemppi are exceptional customer service, good quality and reliability. Our welders like to use the Kemppi machines because the Kemppi customer service listens to their feedback,” Multaniemi adds. A good example of this philosophy is how the SuperSnake subfeeder was acquired to the Inha Works: The first the SuperSnake was tested at the Inha Works for a short period on two different production lines. After the one-month trial period ended, the welders gave feedback to both Multaniemi and Kemppi. “Actually, it was the welders that made the final decision. They promptly said ‘let’s take this, it’s good’. Now we use the SuperSnake on our new boat model, Phantom,” Multaniemi says. Kemppi’s new X8 MIG Welder was warmly welcomed at the Inha Works. The outstanding performance and the improved usability made a convincing first impression. X8 MIG Welder is developed to meet the most demanding expectations for welding productivity and quality. It is a system for unparalleled performance, usability, and management of industrial welding, enabled by the newest IoT-based technologies. 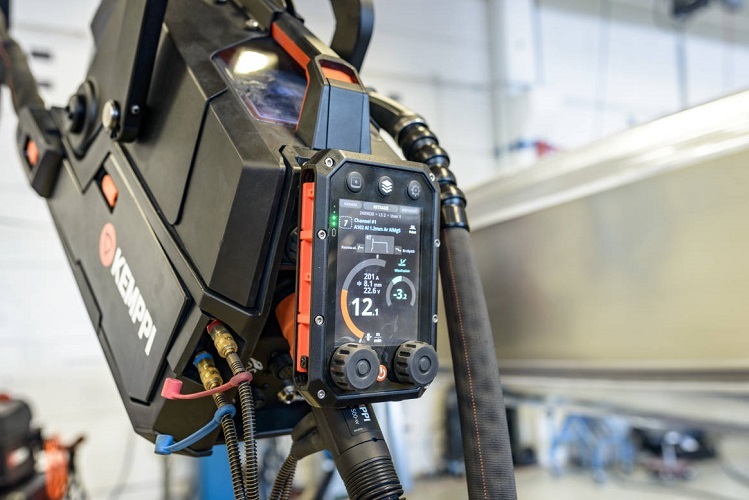 The X8 MIG Welder solution consists of Kemppi’s unique high-duty and upgradeable power source with all-in-one wire feeder, ergonomic welding guns, intelligent welding, brazing, cladding and gouging software, and one-of-a-kind Control Pad for total welding control, including the new digital WPS feature. The wireless device is a fast and easy solution for changing system and welding settings, adjusting and controlling welding values, or viewing WPS content, which has not been available before. With the Control Pad, the whole system can be operated with confidence and unforeseen efficiency. “What we expected to have from the X8 MIG Welder was of course new technology, something to make the aluminum welding processes easier to set and trace,” Multaniemi lists. For example, the X8 Power Source’s wireless user interface, Control Pad, enables effortless parameter setting from the welder’s post without leaving the welding area to set up the equipment. 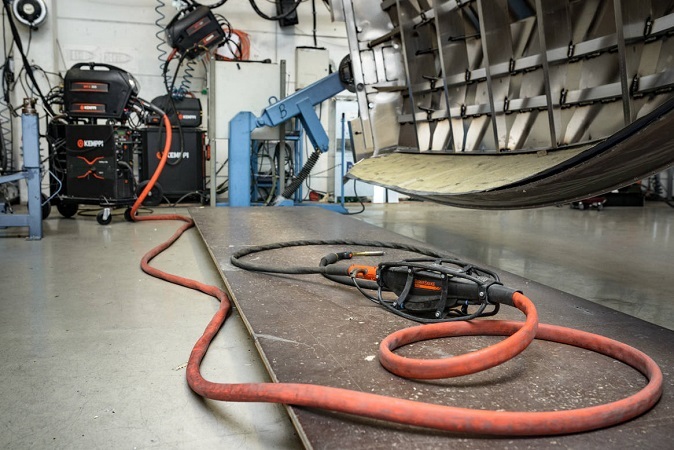 “Our first experiences with X8 MIG Welder have been positive,” Multaniemi adds. Additionally, for years, Buster Boats used to manage welding qualifications manually and each qualification had to be renewed individually. The introduction of the WeldEye solution has shifted the gears in welding management at the Inha Works, making welder qualification management a much faster process. Multaniemi says that even though manual welding cannot be made much faster, the Inha Works highly appreciates usability that also helps to save time. Saving even one minute per boat can lead to 2,000 minutes less production time in one year. “Many small streams make one big river,” Multaniemi aptly remarks. Multaniemi explains that the Inha Works has analyzed all products and operations openly, and all tasks have been scrutinized to the point that all the workers know to the minute how much time they can spend for each operation. This is a base for the performance-related pay that is applied throughout the Inha Works. High-quality welding requires careful preparation. When comparing the X8 MIG Welder with standard MIG welding equipment, its usability aspects in terms of innovative and user-friendly wire feeder, wireless user interface for power source and digital WPS speed up the setup configuration easily by 30 per cent. 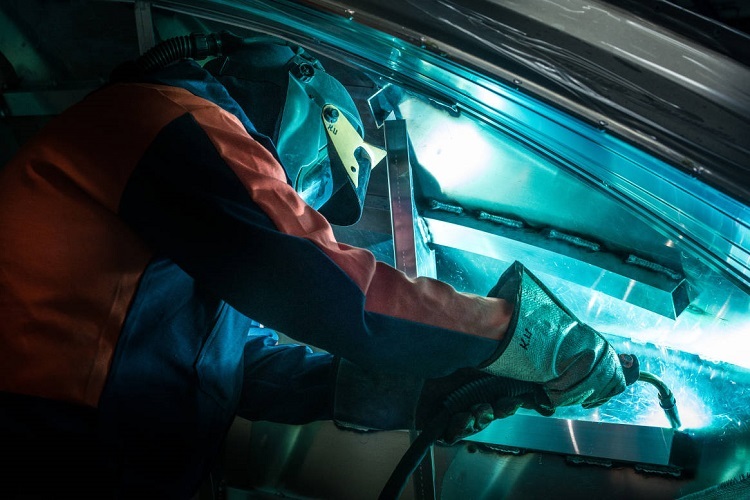 When you can speed up the setup configuration process, you have more time to focus on welding itself. “X8 MIG Welder is a first-class equipment for demanding, high-quality aluminum welding in terms of both arc performance and usability,” Multaniemi praises. To meet the best usability practices, Kemppi has also shaped the welder’s most important tool, the welding gun, for maximum comfort. The X8 MIG Welder redefines ergonomics in welding guns: the hand grip, mobility and stability have been optimized to meet the requirements of the most demanding welding tasks. “The welding gun is really good. It feels better than the previous one. And the most important thing for the welder is the operational reliability,” Welder Kari Urrila comments on his first experiences with the X8 MIG Welder. 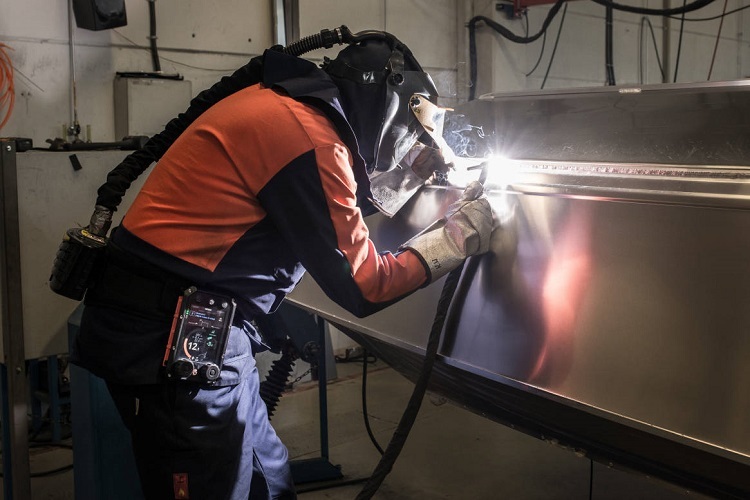 Even though manual welding cannot be made much faster, Buster Boats highly appreciates usability that also helps to save time: even one minute per boat can lead to 2,000 minutes less production time in one year. Buster Boats has analyzed all products and tasks to the point that the workers know to the minute how much time they can spend for each operation. Buster Boats was among the first Kemppi partners to test the new X8 MIG Welder– and to bring it into play. The joint R&D with partners is pivotal for Buster Boats.